Squash House Quilts: The Real Stars! After my successful practice 8-point star blocks I decided it was time to get the real quilt started! Here are my first two "real" stars. The fabric is Collection for a Cause: Hope by Howard Marcus. I've decided not to make the quilt as originally planned but see if I can somehow use these blocks along with the "free" blocks from making the star block and set them all together. Stay tuned as this will surely be a work in progress for a while to come! I wanted to show you another quilt from the show we attended this past Friday. I've never seen nor heard of this "chenille" technique! The fabric appeared to be some sort of gauzy polyester - very interesting. I have no idea how it's done, but it reminded me a little of rug hooking! What do you think? 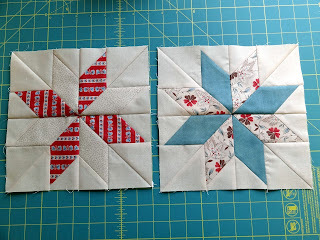 Your "real" star quilt is going to be so pretty and I think incorporating your free block is going to give it even more zing! Interesting little quilt. Just shows you the sky is the limit and no materials are taboo. Nice fresh colorway on your stars! I can't say I would describe that as a Quilt, upon seeing it. It does look like a rug. Fun, though! Your stars are very nice and perfect. Haven't tried your tutorial yet but it is on my to do list. My fabrics came!!!! THANK YOU!! I love them and can't wait to turn them into Dresden Plates ----wooooo hooo!! 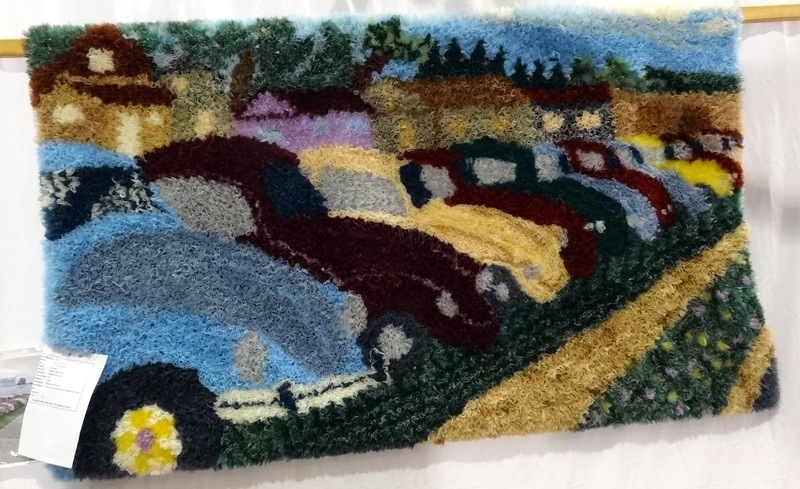 I thought that was rug hooking! Any idea how its done? I really love those stars. A friend of mine used your tutorial then shrunk them down to 5" (which I told her is HUGE!). I really want to try them! Your blocks look so perfect. Are you a perfectionist!!! So pretty...can't wait to see the quilt!